This recipe makes a fairly compact bread, perfect for a lunch on the trail and it’s very delicious on its own! This bread is my own modification of the tour bread recipe of my friend Ivo Vanmontfort. The real original tour bread recipe comes from Fred Triep, but I’m not that fond of the original recipe. I add a lot of nuts to increase the amount of fat. The recipe is based on waldkorn flour. It’s a dark mixture of several types of flour, easy to find in Belgium but I’m not aware of the existence of a similar flour mixture abroad. Last time I prepared the tour bread with a 9 cereal mixture instead of waldkorn flour and it turned out equally successful. 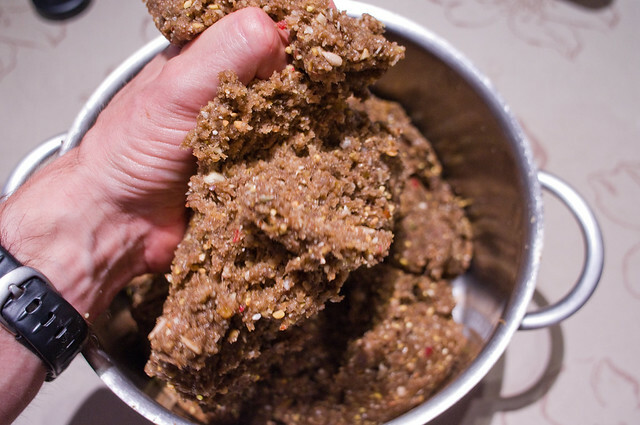 Any mixture of wheat flour, wholegrain flour, rye flour,… will probably turn out as good and as tasty as this recipe. These quantities are good for about 2kg of tour bread. Grind the nuts and dried fruits. 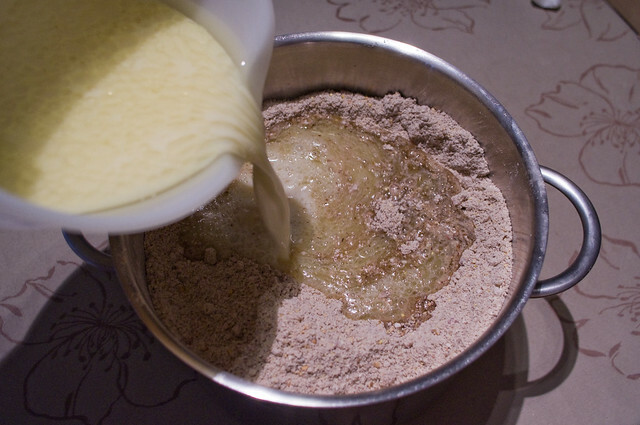 Then mix waldkorn flour, nuts, dried fruits and baking powder into a bowl. 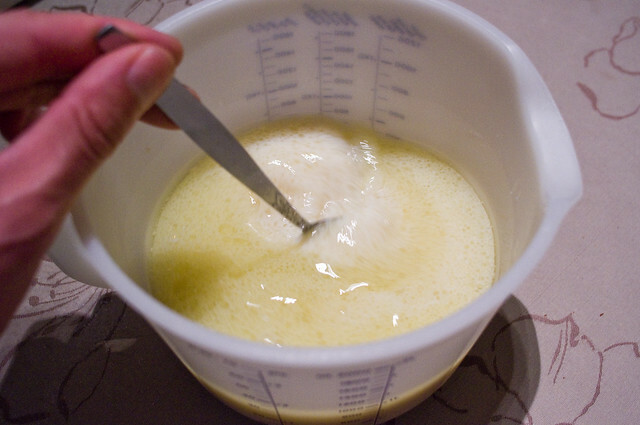 Melt olive oil, honey, sugar and whole milk together over a low heat or in the microwave, then add to the dry mixture. If desired, you can now add chocolate pieces, make sure they melt into the dry mass. Then knead the mass thoroughly into a dough. Spread the dough a few inches thick on parchment on a baking sheet and divide into portions by pushing notches in the dough. Finally bake in the oven for one hour at 160°c. When baked and cooled, wrap the portions in bread bags and store in a dry place. The bread has a shelf life of several months. I’ve stored it for a half year already and it was still perfectly edible after such a long time even though the bread will gradually become more hardened the older it gets. 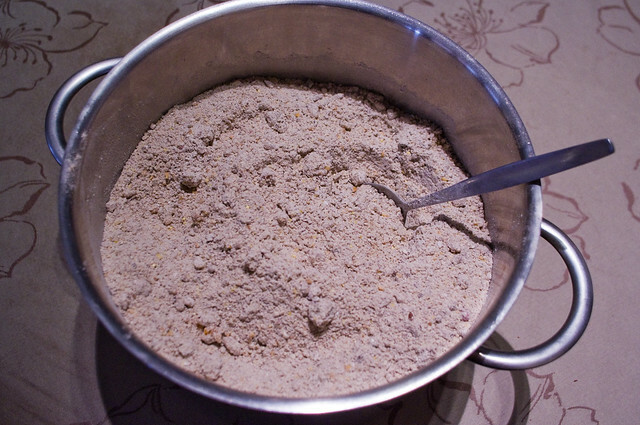 The dry ingredients mixed in a bowl. Pouring the wet mixture on the dry mass. Thoroughly kneading into a dough. I carry the tour bread in the original bread bags or in plastic sealable bags in my backpack and when hungry, just eat and enjoy! Divided into portions on a baking sheet, ready for the oven. This entry was posted in Techniques and tagged Recipes. Bookmark the permalink. 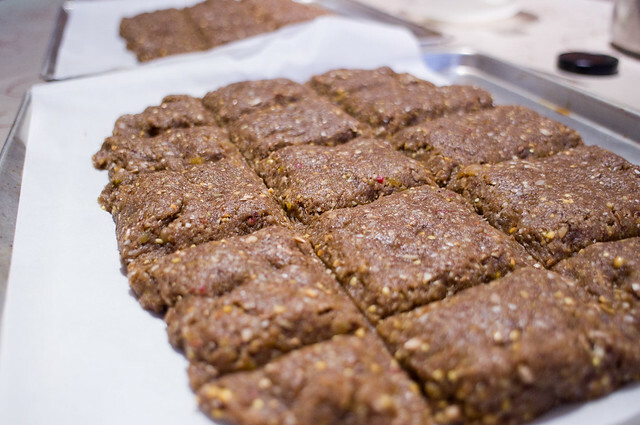 That looks a bit like Logan Bread – a recipe I found 2 months ago on sectionhiker and I like it better than oatsnacks or flapjacks. There are probably a lot of variations as this invites downright to experiment. 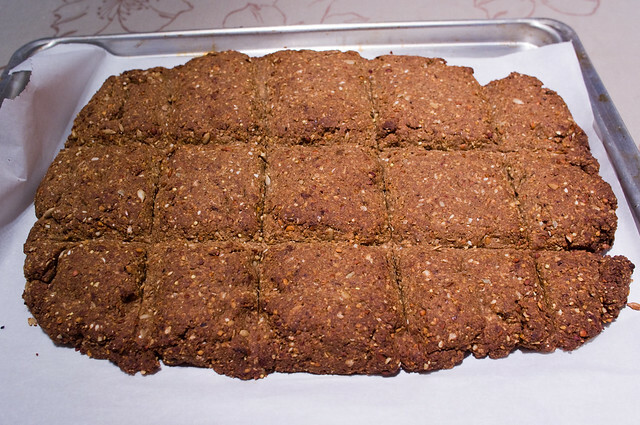 The dark flour makes that is keeps very long (I have it in the freezer) and it is really more like bread than cookie. Where did you find the Waldkorn flour? You can try AVEVE stores or have a look at the local supermarket for a flour mixture. I already tried the local supermarket, but they didn’t offer much choice.